The Space Shuttle Program (SSP) have noted the potential to add STS-135 to the manifest may come via direction from President Obama’s visit to KSC on Thursday. Amid rumors of “extra shuttle flights”, the Technology Development Activity (TDA) group – currently responsible for the ongoing Heavy Lift Launch (HLV) study – have noted they are looking into using shuttle to help with technology demonstrations. There were no signs the President would announce any extra shuttle missions, which proved to be the case with Thursday’s event revolving around the current – and highly unpopular – plan for NASA’s future, as outlined in the FY2011 budget proposal. Some minor “compromises” were confirmed, such as using Orion in a greatly reduced capacity as a lifeboat on the ISS, and a 2015 date to “decide” on a HLV – which was the focus of the President’s address to a hand-picked audience. NASA’s own administrator – Charlie Bolden, and as his assistant Lori Garver – continue to oppose any extension of the shuttle program. (See live update thread for coverage of President Obama’s visit). At present, the shuttle’s flying days would end with STS-133 – which is manifested as the final shuttle mission on the current schedule. This mission will be carrying ELC 4 (EXPRESS Logistics Carrier), along with the Permanent Logistics Module (PLM) that will remain on the International Space Station (ISS). With a launch date of September 16, 2010, Discovery’s 39th flight of her career will utilize External Tank ET-138 for a 10+1 day mission that was to include one EVA, later refined to 8+1 days with no EVAs. A crew of six – led by Astronaut Chief Steven Lindsey – have already been selected for this mission, although this will likely be reduced to a four person crew. 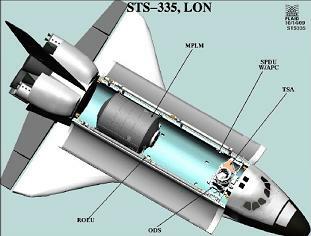 STS-335 was included as the LON (Launch On Need) flight in support of STS-133, which would – in the event of a contingency being called – launch with a MPLM (Multi-Purpose Logistics Module) for the purpose of replenishing the ISS’ consumables for hosting the STS-133 ahead of rescue. In order to be in a good posture for LON, Atlantis would processed almost as per normal, following her return from STS-132 – up to the point of being near-ready to rollover to the Vehicle Assembly Building (VAB) for mating with the External Tank and twin Solid Rocket Boosters (SRBs). Under the STS-335 requirements, it is unlikely she would leave her Orbiter Processing Facility (OPF) unless STS-133 was declared a contingency, which is in itself highly unlikely based on the shuttle’s record since Return To Flight (RTF). With all the hardware paid for, work took place on the process of adding STS-335 as a full mission, known as STS-135. In pre-emption of the mission being baselined, Colonel Lindsey was pencilled in to command the STS-135 mission, should it become baselined, possibly with some of his STS-133 crewmembers. This in turn would open up crew slots on STS-133, which in turn may dictate the timeline STS-135 has to become baselined, in order to allow new crewmembers to be “loaded”. 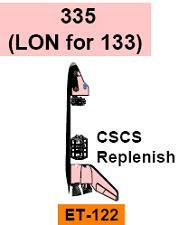 “Space Transportation System (STS)-133 Crew Training: The crew is at L-33 weeks for a September 16 launch date. Several assessments have been made for this flight for a crewmember swap that would occur in April (Lindsey to (STS)-135),” noted the memo at the time – acquired by L2 in January. Should STS-135 become baselined as the final shuttle mission, an agreement would need to be in place with the Russians to provide Soyuz LON support. This is believed to have been the reason the mission became less of a possibility earlier this year – along with NASA’s top brass’ wishes to end shuttle operations as soon as possible. “For now, adding the LON as actual flight will end unless a compelling need arises,” confirmed the DA notes memo (L2), literally hours after the crew loading notes referenced the potential commander swap for STS-133 in relation to STS-135. However, this week’s Shuttle Standup/Integration report (L2) cited President Obama’s arrival at KSC, and an associated possibility that STS-135 could be added under direction. “It is a big week for future manifest discussions. The President is going to speak and they are going to have a council/round table meeting on April 15. There is the potential that we could be directed to go fly an LON mission as a standalone mission. We will just standby to see if we need to do that,” noted SSP manager John Shannon. NASA have already ordered the two SRBs that will fly with Atlantis under the STS-335 LON requirement. 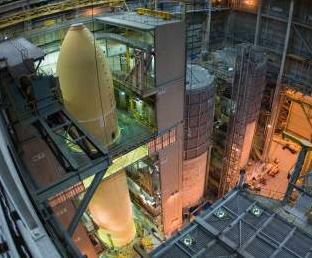 The External Tank – ET-122 – was also added to the flight several months ago, with repair work proceeding well at MAF (Michoud Assembly Facility), following its turnaround from Hurricane Katrina-related damage. “ET-122: Completed all the last sprays in Cell A for the LH2 flange, still have to complete the trims. Wrapping up the ECO (Engine Cut Off Sensors) installation in Cell A. Will re-pressurize as to plan on Thursday, and should lay down on Friday, April 19, and get ready for a move over into Final Assembly,” noted MAF status on ET-122. Although another completed tank is located at the New Orleans facility, ET-122 is the only available Super Light Weight Tank (SLWT), which is a difference of several thousand pounds of added upmass ability at launch when compared to the older test article tank. Several spare tanks also exist on site, but none of these tanks would be ready prior to early 2012, should an extension become a reality. Also, it is not certain that Atlantis would gain STS-135, given she lacks SSPTS (Station-Shuttle Power Transfer System) hardware. Depending on the payload, the length of the mission, and related requirements, a decision on when the mission would fly, and which orbiter would gain the flight, is yet to be defined. Downstream manifest considerations, such as the AMS-2 payload – which is suffering from issues during testing in Holland – would also come into play, potentially swapping the running order of STS-134 and STS-133, although some sources claim the pressure to end shuttle as soon as possible is leading to the potential AMS-2 will be launched, even with a vastly reduced on orbit lifetime. “On April 16, (NASA Associate Administrator for Space Operations) Bill Gerstenmaier will be at ESTEC (European Space Research and Technology Centre) talking to the AMS team,” added Standup notes. “We should get some good information the following week on where AMS will end up in the overall manifest. 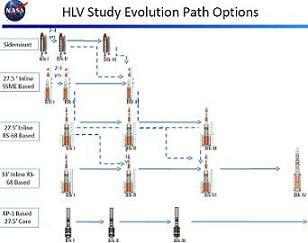 Meanwhile, twice weekly updates (L2) from the Technology Development Activity (TDA) – which took over from the HLV studies after the FY2011 budget proposal ended any realistic chance a Shuttle Derived HLV, and Augustine Commission noted viability for a shuttle extension of any significant length – made a vague reference to extra shuttle flights this week. It is currently unclear as to what the shuttle would be used for for these demonstrations, or if it would be viable, without a large manifest stretch up to STS-135, allowing for the next tank – in support of STS-136 – to be available within a reasonable timescale.